New Zealand Handmade: Creating Handmade with a Theme.. Creating Handmade with a Theme.. In March, Hastings will again be host to the “Horse of the Year” event,one of the largest and most prestigious annual equestrian events in the Southern Hemisphere. Popular with the competitors on horse but also with observers watching from the grandstand and around the arenas, it will draw a large enthusiastic crowd to Hawke’s Bay. With my jewellery I will be part of the event as trades person, sharing a stall with other jewellers who offer “horsey” pendants, rings, earrings etc. During the last weeks I have been reading about white horses- which are rarer than other colours of horses: they have a special significance in the mythologies of cultures around the world, transcending the normal world and triumphing over negative forces. Over time the symbolism of the white horse has varied: wisdom, fertility and spiritual energy are mentioned; riders have been messengers, saints (like St George, the patron saint of horsemen), heros. Norse myths describe eight-legged horses, the Greek winged horse “Pegasus” is one of the best known fantastical as well as mythological creatures. And then there are the white horses on the hills in England! I was very impressed by my reading material, memories of the time as horsemother came up and ideas were taking shape. 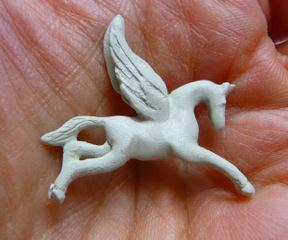 My first item for March is a winged horse, Pegasus. I made it from “Art Clay Silver”, my favourite medium; again and again I am amazed how the dried silver clay can be carved and drilled and sanded. It is such a joy to work with it! 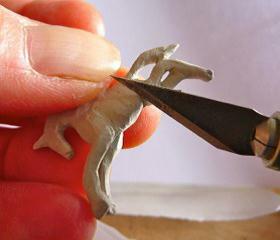 The photos show the work on it in the dry stage and the finished jewellery piece. 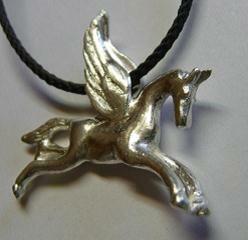 Wow this pegasus is amazing. It always amazes me how you can work with such fine pieces but get such stunning results. Lovely work! I eally want to try cilver clay some day! Wish I could come down to hastings - mad on horses!